Your baby’s comfort is paramount when you take them out and about. A poorly-designed travel system leads to fidgeting and crying. Parents don’t want to deal with that when they’re out shopping or going for a nice, peaceful walk. More complex travel systems also leave more room for manufacturer’s errors. When convertibility comes into play, you need a system that switches from one form to another smoothly and locks firmly in place. The United States Consumer Product Safety Commission (CPSC) has various regulations in place to cover these issues, which you should check any potential stroller purchase against. Make the right choice and you’ll have a stroller that will last throughout your child’s infancy. The best may even last for several children. Comfort, size, ease of use, and storage all play a role in choosing a good travel system. After speaking to several parents, I’ve created a list of eight strollers that I think will suit your needs. Each offers something different, so read carefully to find the right one for you. The 360-degree motion of this travel system may definitely be its best feature. The 12.5-inch front wheel swivels easily, making corners a breeze. However, you can also lock it into place if you know you’re going to walk in a straight line for a while and don’t want to risk the stroller going off track. The two back wheels stand at 16 inches, which elevates the seat. I like the seat’s width, as it provides plenty of space for restless babies, plus the back is high enough for a seated baby to get a good view of their surroundings. You can also recline the seat backward. 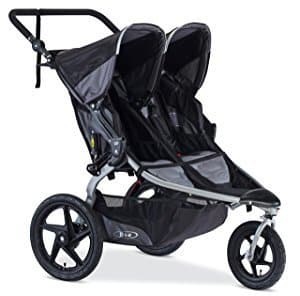 The stroller has also been built with joggers in mind, and it comes with a small leash to keep parents latched to the handlebars while running. The 25.7-pound weight makes it easy to push, and it can carry a maximum weight of 75 pounds. I also like the tire pump, which comes with the stroller. The travel system has an aluminum frame, making it r﻿﻿ust-﻿﻿resistant, and a polyester seat and covers. This makes it easy to wipe down with soap and water if any food or drink spills onto it. Storage is also a major feature, as there’s a pouch at the base and several mesh pockets. The handlebars also contain a parent organizer, which has slots for two bottles and a small zip pocket. The stroller can fold in on itself for transport, but the rear wheels may make it too large for small car trunks. You can remove them, but that’s not ideal if you’re in a rush. I also didn’t like the metal bar across the bottom storage pouch, as this limits what you can put into it. Offering three modes of transport, the Bravo Trio may be one of the most versatile travel systems on the market. In addition to the stroller, you get a detachable baby carrier. This also converts into a car seat, with the included adapter, offering an all-in-one solution. The stroller has four wheels, each of which has shock-absorbing qualities. When attached to the stroller, the seat reclines through several positions. Your baby can lay back while sleeping, or sit up to examine their surroundings while awake. It has a one-hand fold system, which you activate via a small lever under the seat cover. The front wheels automatically rotate into position as you fold too. Once folded, the stroller stands on its back wheels, so you don’t have to worry about damaging it because you’ve laid it on the ground. I was also impressed with the number of parent-centric features. You can adjust the handlebar’s height, which may make this a good choice for tall parents who find that other strollers don’t suit their needs. There’s also a parent tray with two bottle holders, and a large pouch at the bottom. It comes with canopies for both the stroller and carry seat, though the latter has a habit of retreating back when in use. I’m also not a fan of the plastic wheels, which don’t live up to the build quality of the rest of the travel system. 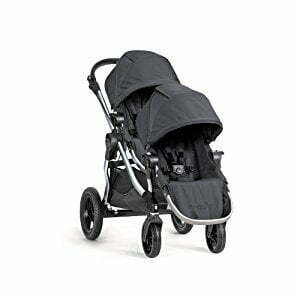 This twin travel system comes in black, and features individual canopies for each of the two seats. I particularly like the adjustable handlebar. As well as featuring plenty of padding, it adjusts through nine settings. The travel system has a three-wheel design, with the front wheel capable of swiveling 360 degrees. This makes going around tight corners simple, but you can also lock the wheel when you need more stability. This proves particularly useful on rough surfaces, or when jogging with the stroller. Despite having two seats, it only weighs 33.1 pounds. This may still tire you out with extended use, but you won’t find yourself struggling to keep it moving forward. It also has a two-step folding system, making it portable. The polymer wheels have inflatable tires, leading to a smoother ride. It also has a good suspension system, which offers three inches of travel. 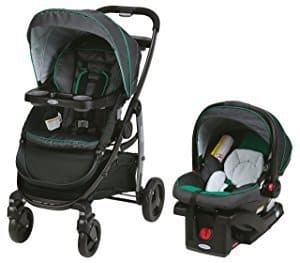 You can also attach a car seat to the stroller, with the travel system able to hold most seats from major brands, as well as BOB’s own offerings. While the stroller has a sizeable storage pouch, it doesn’t have a parent organizer on the handlebars. You can buy a few accessories, including an organizer and seat adapter, but they may cost more than you’re willing to spend for features that other travel systems have as standard features. I also think the seats are a touch on the shallow side. Although each can hold 50 pounds, your little one will outgrow the seats long before hitting that limit. Another three-in-one travel system, this stroller works well for both infants and toddlers. It has a detachable infant car seat, which also doubles as the seat when using the stroller for babies. As your child grows, you can remove the seat and use the one built into the stroller. You also have several choices about how you’ll attach the car seat. You can have it facing you as you push your baby, or have it facing the outside world to give them something to look at. It also has four reclining settings once it’s attached to the stroller. The car seat carries a maximum weight of 35 pounds, while the toddler stroller can handle 50 pounds. The latter also comes with a footrest, so your toddler’s legs won’t dangle and potentially strike the ground. It is on the heavy side, weighing in at almost 44 pounds. As a result, you can’t use it while jogging and may find it slightly tough to maneuver. It has a four-wheel base, which improves stability, but gives it a large turning arc. It has a parent organizer under the handlebars, with two large bottle holders. There’s a similar organizer that attaches to the stroller’s front, which holds a further two bottles and has a small tray. There’s also a storage section at the stroller’s base. It’s quite bulky, plus the build quality isn’t as high as I would have liked. The wheels may squeak on occasion, and the canopies have a habit of sticking. This travel system mirrors the three-wheel design of some of the other strollers on this list. However, it actually has two wheels at the front point, which join together on a central pivot to provide stability and allow easy turning. The system comes with a stroller and baby carrier. The latter also has deep foam built into the sides, which protects your baby from any impacts. Britax’s Safe Cell Impact system also creates a smoother ride, and goes above and beyond the current federal safety standards. It has a lightweight aluminum frame, and features the company’s Click and Go system. 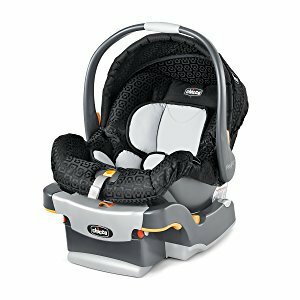 This allows you to pair the baby carrier seat with any stroller in the Britax range, as well as the one that comes with this system. There’s a small, mesh storage pouch at the base of the stroller, with a parking brake just behind it. I also like the one-hand folding system, as you can get the stroller folded and into the car while carrying your baby. It has thin, hard wheels, which may make the ride feel harsh on unsmooth terrain. Also, make sure you buy the latest model if you choose this travel system. Britax recalled some of the earlier models due to safety concerns, so buying pre-owned isn’t an option. Perhaps one of the most versatile travel systems on this list, the City Select has 16 configurations. Baby Jogger designed it with the intention of staying with you as your family grows, though you can also use it if you have twins. The main stroller features an elevated seat, with room in front of it to fit the separate baby carrier. 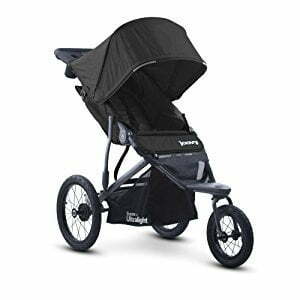 This improves portability, and means you’re not dealing with a wide stroller in narrow places. However, fitting the second seat does hamper visibility for the baby sitting in the regular seat. On the plus side, you can fit the second seat so it faces either front or back. The latter may be useful for keeping the baby in the first seat entertained, as they can see the other infant. Each seat holds a maximum weight of 45 pounds. Both seats have several recline options, and each comes with its own ultraviolet (UV) 50+ canopy. The 8-inch front wheels swivel smoothly, but you can also lock them when taking on harsh terrain. I also like the adjustable handlebar, which features a handbrake, so you don’t have to reach in with your foot. There’s a storage pouch underneath, though you may find it difficult to access when using both chairs. It’s also a tight squeeze for toddlers with the second seat attached, as the other seat restricts legroom. Finally, the travel system weighs 35 pounds with all parts attached, which affects maneuverability slightly. Another travel system that comes with both a stroller and car seat, the JourneyLite has a padded seat that absorbs some of the bumps while traveling. It has a four-wheel design, with both front wheels having locks if you need some extra stability. The car seat has a maximum carry weight of 35 pounds, while the stroller can hold up to 50 pounds. This makes the latter suitable for both babies and toddlers. The stroller also has a footrest to prevent little legs from dangling. It has two storage trays, one of which fits on the front of the stroller while the other is below the handlebars. While they’re nice ideas, I think the cup holders need to be a touch deeper, as it’s easy for larger cups and bottles to fall out. A button-based mechanism on the handlebar allows for easy folding, plus you can stand the travel system on its wheels when folded. Unfortunately, the handlebar is not adjustable. Each back wheel has a parking brake too, though I’m not sure why this couldn’t be made into a single-pedal system. I particularly like the canopy, as it provides plenty of coverage and has a mesh window. This is great for curious passengers who want to see some of what’s going on around them. 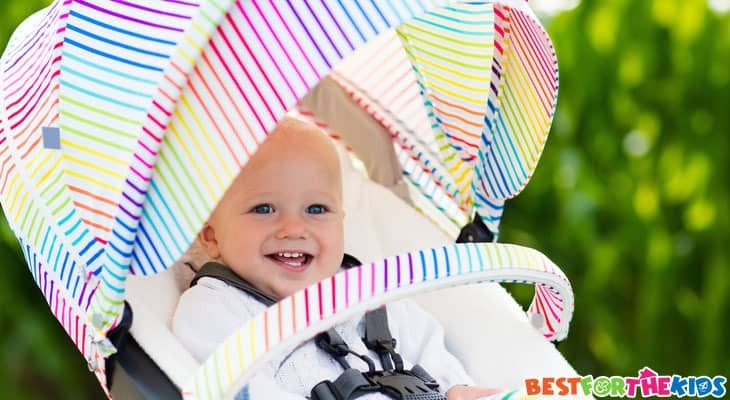 The stroller seat also has a five-point harness system, which you can adjust as your child grows, whereas the car seat has a three-point system. There are a couple of small problems. For example, the front wheels have a habit of sticking slightly, and the folding mechanism isn’t as smooth as I would like. The car seat also feels coarser than the stroller seat. With any travel system, you’ll have to think about what’s best for both you and your baby. The most comfortable travel system in the world won’t do you much good if you have to stoop to use it. However, you can’t sacrifice your baby’s comfort for your own either. 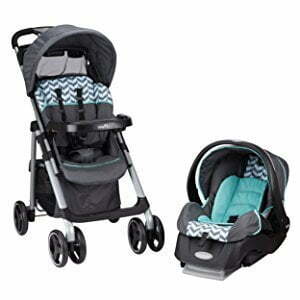 As a result, an ideal travel system should use soft padded materials for the seats. An adjustable handlebar helps, but you may have to check the heights to ensure they suit you. The wheel base also plays a part in your decision. Some parents prefer three-wheel bases, as these offer greater maneuverability. However, others may prefer the greater stability of a four-wheel base. Finally, figure in the overall weight of the travel system. While a heavy system may feel safer, it’s also more of a chore to use. A lighter system may work better, but may also have floatier steering. Many travel systems make a big deal out of the cornering abilities. However, these won’t help you when you hit rough terrain. If the front wheels don’t lock, you’ll struggle to keep the stroller under control. Ideally, the lock will be easily accessible, and can be activated immediately. Only consider a system without a front wheel lock if you’re certain you won’t use it while jogging or on rough terrain. Practically all travel systems come with a storage pouch at the base of the stroller. It’s still worth looking in more detail though, as some pouches hold more than others. In some cases, a design feature may also restrict access when the system is in use. Many systems also come with trays, sometimes known as parent organizers. These typically have a couple of cup holders, and a small space in the center for phones or change. Unfortunately, some manufacturers sell these separately. The biggest difference between a standard stroller and a travel system is usually the ability to use the latter in several ways. Many systems either adapt as your baby grows into a toddler, or features extra travel options. Some come with car seats, making them even more versatile. Your baby or toddler will spend a lot of time in their travel system. As a result, choosing one that’s comfortable for both of you is key. If you don’t, you risk either making your child uncomfortable or causing yourself some harm because you’re trying to use an unsuitable travel system. Look for versatility and customizability in a good travel system. Storage is also a bonus, especially if you’re heading out on a long trip. The stroller should also be able to carry enough weight to suit your child, and have a degree of portability when not in use. With my list, I’ve highlighted seven travel systems that I think tick most parents’ boxes. No stroller is truly perfect, but you should be able to find one that suits your needs. 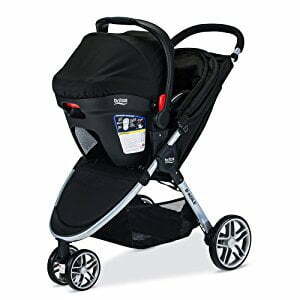 Consider what you’re looking for, then check your desired features against those of each stroller. If you don’t find what you’re looking for, you can still use the information in this article to find a good stroller.